63083 PER2233.jpg 500X638\PER2233.jpg 40372 PER2233_1.jpg 500X638\PER2233_1.jpg Send A Hint! 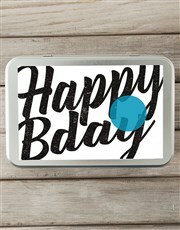 Spoil someone dear to you on their birthday with this snack tin which is branded with a cool 'Happy Bday' design and is personalised with a message. 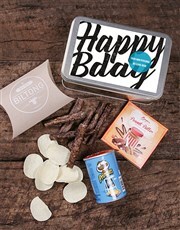 Inside is a selection of yummy treats including droewors (100g), a peanut butter slab (80g), and Pringles Salt & Vinegar (47g). He or she will be extremely thankful! Get this Personalised Happy Bday Snack Tin delivered with NetFlorist.